The IT Cosmetics Friends & Family Sale starts today and runs through 4/28/17 at 11:59pm Eastern. Now is the perfect time to stock up on all of your favorite products or try some new ones! I'll be picking up a new tube of the CC+ Cream which is a staple for me, particularly in the summer when I want to make sure I'm wearing SPF every day. I also need a new tube of the SuperHero Mascara which I just recently tried and fell in love with and I'm about halfway through my jar of Bye Bye Makeup Cleansing Balm so I figure I should get another one now while it's on sale. Finally I've been dying to try the new Confidence in an Eye Cream ($38) and with this sale it's only $28.50! 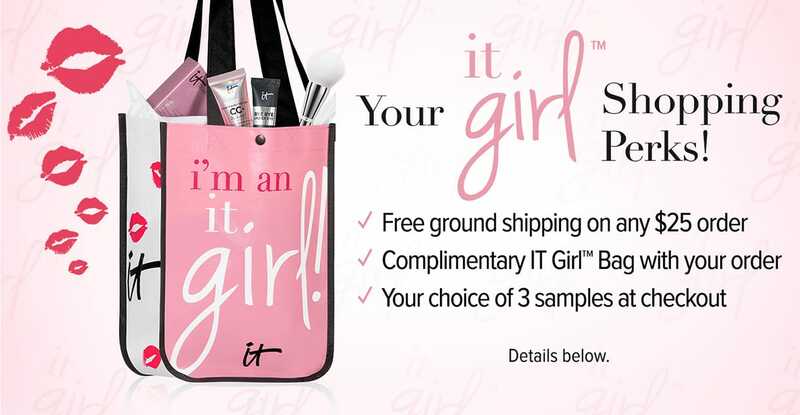 They're also offering free shipping over $25, 3 samples at checkout, and a cute reusable IT Girl Tote Bag. Are you shopping the It Cosmetics Friends and Family sale? If so, what are you getting? I'd love to hear about it in the comments below! Yessss! I have such a big list of things I want! I missed out on the Naturally Pretty palette when it was on sale at Ulta because it sold out. I'm sad that I missed it at 50% off but 25% is better than nothing. I also want to try the Cleansing Balm after seeing your reviews on it and I need a new CC cream also. Thanks for the heads up! Hey Jen, I know you purchased light for the CC cream and I know you're fairly pale, but do you know what shade range you are for MAC? I feel like I'm between NC 10-15, but from swatches, looks like fair might be a better color for people like me.